The land of incredible bio-diversity, India is visited by large number of global tourists every year. Harbouring innumerable variety of plants and animals, its reserve forests and protected areas offer excellent opportunity for witnessing several unique species of wildlife from close quarters. But, tourists often overlook the guidelines to be followed and tips to keep in mind while exploring any wildlife habitat. To help the first time visitors we have prepared a list of wildlife travel tips to keep in mind while planning a wildlife safari in India. All regions of the country do not experience the same temperature throughout the year. It is advisable to learn about the place in details and pack clothes as per the weather report. The common precautions required for the safety of health should be followed. Talk to your family practitioner frankly even about your minor health issues at least six weeks before travelling. Immunisations for tetanus, diptheria, typhoid, hepatitis A, rabies and polio should be up to date. Take enough precautions for the safety of your skin against sun exposure and heat, especially if you are planning to enjoy safaris. Make sure you have proper travel insurance. For wildlife safari choose clothes with earth-tone colours or one which are not perky. Matte Green, brown, and grey are some colours which are perfect for wearing during a safari. While packing do not forget to pack antiseptic cream, a raincoat, a mosquito repellant, a small torch, band-aids, water bottle, first-aid kit, and personal hygiene products. Always keep your address proof and identity card in your hand bag. Whenever we enter a park we find a number of instructions written on differently sized boards. But, hardly people abide by the restrictions. As a sensible wildlife enthusiast you should be aware about the do’s and don’ts in the park during wildlife tour along with a few self-protective cautions. One should wear dresses that cover the arms and the neck as well as the legs and the feet. There are various types of insects in the wild which are quite poisonous and their bite can cause irritation. It will be a good idea if you can use layers of clothes. Do not carry anything which is absolutely of no use during your jungle safari. After enjoying a day long safari one is bound to feel tired when a heavy backpack will simply make you overburdened. If you or any of your family member is allergic to dust or animal fur, always carry the basic medicines you need for instant relief. Do not make a noise is a phrase that every Indian child comes to know at its first learning stage, yet we love to chatter. But at least try avoiding useless talks and devote your attention to wildlife sighting. Do not forget animals have a very strong hearing capacity and they can get disturbed even by your whispering. Better not to take your kids during jungle safari if they are below 4 years. They might get frightened seeing any giant animal and start crying. It will keep all wildlife away and you wouldn’t be able to sight them. It’s advisable not to carry cell phones during a wildlife safari. Even if you are carrying one, keep it switched off or try to keep it in silent mood. If you are left with a bag full of litter, bring them back outside and throw them in proper garbage bin. Do not use any combustible substance inside the park. It will not only cause danger to you but can take the lives of numerous innocent animals. Never ever bring your pets with you during a wildlife safari no matter how special it is to you. It will create unnecessary chaos. The wild animals might get agitated listening to your pets’ sound. Never use any perfume while going for wildlife sighting. Animals have a strong sense of smell and they might get distracted. Before heading to a wildlife safari one should always keep it in mind that one is going to invade the natural residence of animals. Each animal has a unique behavior and even a little bit of human interference can make them feel irritated. Thus it is always advisable to abide by the safety measures for a perfect wildlife tour to make your experience remarkable. Before heading on a safari, make sure you are guided by an expert naturalist. Never try to feed any wild animal. Do not disturb the natural activities of animals like mating, predation, grazing or feeding their young ones. Never throw stones at them. Always maintain a sensible distance from the wildlife and observe them from. Always turn flash mood off while taking photographs or shooting videos. Do not get down from jeep at any point unless your guide commands. Your life can be in danger. If someone is displaying insensible behavior do inform the authority. It can be hazardous to you as well. Move as slowly as possible. It’s better if you can choose a safer place and observe their activities. Devote at least three days to increase chances of sighting big cats. 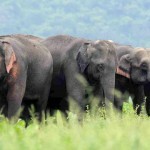 Try to go for an elephant safari where it is possible. The only reason behind this is as you ride on a high altitude you can see the animals of faraway places very easily. Tiger-tracking on foot is a trending idea which lets you feel thrilling and adds twist to the standard safari experience. 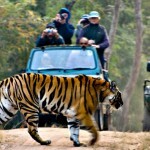 In India, Satpura National Park is known to be the best destination for experiencing tiger-tracking. It is an unbeatable truth that the forests in India are home to the best possible population of wildlife among which tigers rank at the highest. It is estimated that tigers are found in approx 25 reserves of India where around 40% of the world’s tiger population reside. 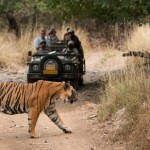 While Ranthambore National Park is home to the highest number of tigers, their density is the highest in Bandhavgarh. 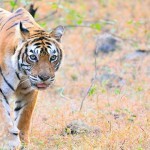 However, one should always keep it in mind that summer season is the best time for sighting tigers in India. This is the season when tigers come out in search of water and assemble near a common lake or pond. Tiger sighting in monsoon is a matter of luck. So, if you follow the tips mentioned here then there are better chances of you catching sight of this elusive animal during your wildlife safari tour.